Disclaimer: This will probably read somewhat like a review. And some might say that reviewing a pre-release beta of a game is unfair. But this NDA lift comes only five days before Alganon's planned release date, and I am confident that version 1.0.3, which I have been testing, is not going to be far removed from what they are selling next week. The first I heard of Alganon was when Tobold was giving away some beta keys over on his blog. I didn't win one from him, but I did win one from Massively a few days later. 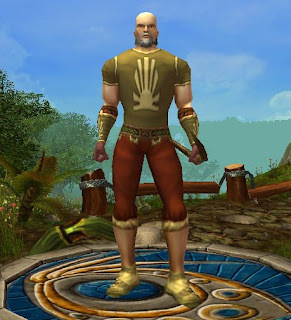 Alganon bills itself as "A Unique Fantasy MMORPG," but in reality there is little unique about it, it's a very standard DikuMUD-influenced race/class/level/quest fantasy MMORPG. It is being developed by Quest Online, a company formed by David Allen, the original designer of Horizons: Empire of Istaria, after he was rolled out of Artifact Entertainment. It has a strong following amongst the loyalists who will tell you even now that Horizons would have been the best MMO ever (instead of, as it is widely regarded, perhaps the worst), if only Allen's vision for the game had come to fruition. Pretty standard looking stuff. There are two races in game at launch, which also seem to represent two factions - Asharr humans (human-looking humans) and Talrok Kujix (funny-coloured tattooed humans). Four classes are available - soldier, ranger, healer and magus. I go for a ranger - the description talks about their animal companions but apparently that design has been abandoned and they are basically just archers now, I think. Appearance customization is minimal, and cycling through the face, hair, etc. options takes several seconds per click, making it an exercise in frustration. I hit "randomize" and accept my bald greybeard. First thing I tried to do for this article is take a screenshot upon entering the game. It threw a LUA error. Luckily I was able to get a shot by switching to windowed mode and using standard Windows "alt-printscreen and paste". Pretty standard looking interface. But.. wow, so ugly. Yes, that font really is Arial. Yes, that bottom bar is WoW's apart from the startling innovation of putting the backpacks on the left. That key icon on the far left? It's only there because WoW has a keyring with that button. Alganon doesn't have a keyring but they forgot to remove the icon when they copied the UI design. I speak to Woss Jordan, the obligatory first questgiver. He gives me a quest to.. talk to his brother Tass Jordan, standing all of three feet away. The reward, +100 Ardonya Guard rep. Nice! Let's see how much rep I need to go up in the estimation of the Ardonya Guard! Whoops looks like they haven't implemented the rep pane yet. Tass Jordan puts me to work, demanding 8 Andar Wolf Pelts, and offering the princely sum of five copper pieces.. and another +100 Ardonya Guard rep! So off to kill the wolves I go. Combat is dire even for a genre not exactly known for its interactivity, especially for level one characters. It involves lobbing off a "Power Shot" (a 10-second cooldown shot that seems to do roughly 1 more damage than my autoshot), maybe one or two autoshots, and then trading poorly-animated blows with my axe for fifteen seconds or so, watching the enormous Arial text float above us, until the wolf lies dead - and I'm on 80/80 health because he was doing less damage to me than I could naturally recover. It's some ugly stuff, too. My arrow shots are slow-moving brightly-coloured blobs. Animations are very poor, not surprising for a low-budget title. Good-looking human animations are about the hardest thing for artists to get right. It's not helped by some seriously jerky movement. Mobs don't react immediately when you attack them, and when they did come for me, they often went straight through me and then rubberbanded back. Other times, my character would start swinging his axe (and, according to the combat log, connecting) when the target still seemed about twenty feet away. Between the general quality of the graphics, the horribly ugly UI, and poor animations, I'm struggling to think of the last time I saw a game this unattractive. We'd definitely be going back to early this decade, to the days before WoW and EQ2 really raised the bar, in two very different styles. Unlike WoW, where you don't get your first talent point to customize your character until level 10, Alganon starts you off with one talent, sorry, "ability" point, and you earn one more a level right from the start. Only problem is, what to spend it on? Seven of the nine lowest tier talents available provide boosts to abilities I don't have yet. I decide that 1% reduction in the cost of Power Shot sounds pretty minor, and go for +1% parry instead. The parry chance on my character sheet remains obstinately stuck on 5% despite my talent. 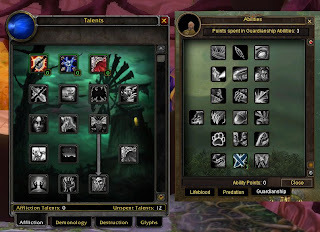 But speaking of talents, let's take a look at the talent window, comparing it to WoW. Some game mechanics are frighteningly derivative, too, like the warrior (sorry, "soldier") and his rage (sorry, "anger") bar that grows during combat, and is spent to use combat moves. I'm much more inclined to give this a pass, though, since duplicated game mechanics do fall rather more into the "everyone does it" area. Crafting is, as far as I can see, entirely derivative of WoW also. You can learn all tradeskills in the beta, but for release, apparently the limit is two. Same as WoW. 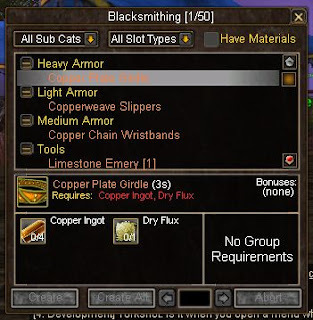 Tradeskills are mining, blacksmithing, herbalism, alchemy, skinning, leatherworking, tailoring and.. salvaging? What's this? One of the eight tradeskills is not the same as in WoW? "Salvaging allows players to break down crafted and enchanted items into raw materials. An increased skill in Salvaging allows the breakdown of more powerful items." Aha, so it's disenchanting. The actual mechanics are also appear identical. Fixed recipes, difficulties starting at orange for guaranteed skillups, then becoming yellow. I'm guessing green and then grey will follow, but I didn't have the stamina to grind that far. Alganon's "About Alganon" and "Features" pages talk about a lot of unique features which supposedly make the game stand out from the crowd. Just one problem: virtually none of these features have actually yet been implemented in game. A community rep has stated on the beta testers' forum that the website should be updated "soon," but it hasn't happened yet, and to my mind it is just unethical to be soliciting pre-orders whilst advertising these features in such a way as to make it seem that they are already implemented and will be in-game at launch time. The kudos system, the consignment system, deities and crusades, custom dynamic quests, pets, appearance changing as you level up, instances, UI customization, battlegrounds, indeed PvP of any sort: all of these features are described on those two pages with no mention whatsoever of the fact that they are not yet in game. About the only distinguishing feature which is present is the "studies" system. This can best be described as the skill training system from Eve Online, bolted on top of the class/level system. Various studies - some combat related, some magical, some crafting related, etc. - can be queued up to train real-time. The intention being that all players, regardless of whether they can dedicate heavy or light amounts of time to playing, will advance at the same rate in at least this area of character development. My initial dabblings found studies taking times ranging from 10 minutes to 1 day to complete. 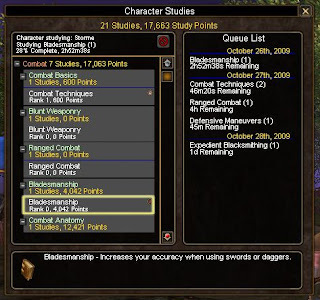 There are combat-related ones which do things like "increases your accuracy when using swords and daggers", stat-boosting ones, and crafting ones which apparently grant access to new recipes. They're not massively interesting, and I have to wonder how well the real-time advancement is going to interact with Quest Online's decision to cut all but two races and four classes from the initial launch. Assuming more races and classes are added at a later date, anyone who wants to play one of them is going to be put in a position where they have to abandon all of their study advancement and start from scratch to do so. Interestingly, a lot of elements not yet in game are able to be accessed through the keybindings menu. Some, like Kudos and Pets, bring up mostly laid-out windows with placeholder text. Others simply throw LUA errors. 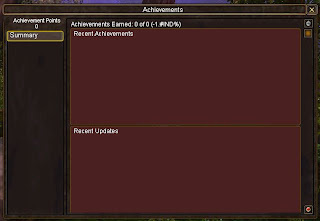 The "achievements" window keybind brings up an empty window. I haven't seen any mention of achievements on the website, so this was interesting, almost an easter egg! One does wonder when they plan to clean out all this half-finished stuff, though, given that the game is supposed to officially launch in five days time, and headstart access for people who pre-order is supposed to start in three days! Alganon, as it stands now, is unattractive, unoriginal, uninspired and unfinished. It is being plugged as some sort of niche title, but I'll be damned if I can figure what niche it is trying to target. To me, a niche game is something like Eve Online or Darkfall which very consciously features design decisions that will only appeal to a subset of gamers. The design goal behind Alganon, as far as I can tell, is "slavishly imitate WoW, and then add a couple of new features that we think would be cool." The only problem is, the imitation is of the poorest imaginable quality, and hardly any of the new features have been added. Why is Alganon launching in such an unfinished state? One can only assume that the money has run out, and they need to shift some boxes in order to keep paying the bills. Talking the big talk about features and selling pre-orders while the game is still under NDA is one way to try to raise some cash. I can't imagine it's going to lead to anything other than a trainwreck though. Games like Age of Conan and Warhammer Online have demonstrated how remarkably little tolerance the gaming public has for games launching in a poor state - and both those games were in much, much better shape than Alganon. I've probably played 15 or so MMORPGs over the last six years, and I cannot see any way that three more days work by Quest Online is going to make Alganon anything other than the poorest title I have ever seen on the market. Pretty much hit the nail on the head there.. I knew the name David Allen sounded familiar but I just couldnt place it. It's not only copied, it's copied badly. Just check those skills pages. The texts aren't properly centered. Thanks for the review! I downloaded the client this weekend and just didn't have time to install it. Now I just won't bother. I played Runes of Magic and had assumed it would be at least on par with that but this title sounds like a complete stinker. FYI, I tried Horizons way back when for all of 30mins before I gave up. In concept it was awesome, but in reality the graphics, lag, unfinished look of the game and mechanics were TERRIBLE. To date it was the worst beta I've ever been in. Good review. You picked the same class as I did for the beta and had very similar experiences. I didn't think the game was worth a thousand words, though. The amount of plagiarism is kind of astounding. What are they smoking over there? Excellent blog post, thanks for taking the time and trouble to put this together. Regarding legal issues generally games companies don't go for each other even where it's blatant. It's more or less an open secret in the industry that everyone steals off everyone else. The "WoW interface" actually originated in Asheron's Call 2 so it would be particularly sticky ground for Blizzard. Put it this way - they could start a court case aimed at getting a percentage of Alganon's earnings which if it goes wrong could end up with a judge ruling that although Alganon copied the UI, IP on the UI does not belong to Blizzard. This would allow whoever owns the AC2 rights to sue Blizzard for a chunk of WoW's profits. And of course Asheron's Call ripped off a lot from Everquest which was so close to one of the preceding MUDs it even had some of the same text and the MUDs rip off older MUDs and D&D which rips off Tolkien who ripped off ancient English and Scandinavian mythology. So considering all that I doubt we will see any IP suits except where they are using someone else's trademark. For example if you made a Dragons and Dungeons MMO you might get sued by the owner of Dungeons and Dragons because it's close to their trademark. Having said all that it simply doesn't need to be sued. It will be bought by a handful of people who are diehard Horizons fans (all 4 of them) or people who simply buy anything they like the box art for. And almost none will renew after their free month. Then this terrible lazy piece of game design will die the death it deserves. Regarding their business model they would be crazy to not be sub-based. Speaking cynically they need to get $50 off people before people see how bad their product is. In fact if I were advising them I'd recommend $200 lifetime subs as something they should be pushing. And have a fast plane ready to somewhere that doesn't recognise US/Western European civil judgments. Excellent post, I had thoughts of writing something up myself using screenshots as you did so it was nice to see someone do the side by sides. This is a great preview for such a bad game. While there is elements of truth in your review by you own admission you were lazy and did not do certain things. For example saying that the ranger is just an archer tells me you did not even take the time to do some research on the website, nor play it more then a few levels at the start. The crafting system on the surface looks a lot like WOWs, but if you actually got very deep into it you find it changes. QoL has people enter things with the familiar as they take them on a journey towards what is truely theirs. Your comment also saying this is the worst game you have played at release tells me you are not that experienced. I could list a lot of bigger titles I beta tested that were in worse shape at release, which somehow survived. This does not mean QoL does not have more work to do, and by pushing the release back for over a month we will see how far they go. Reviewing your review I find you inexperienced and a tad bit lazy in your game play. To much so to be writing reviews that I would pay much attention too. Hopefully you listen to those who do not like your work as much as QoL seems to. mcbride, please do name a couple of bigger titles that were in worse shape at release than Alganon would have been if it had launched this week. I'll concede that while I have played most of the first generation MMOs, I didn't see them at release. Certainly nothing of the post-WoW generation has been even remotely as poor as the current state of Alganon. Even celebrated failures like Age of Conan (which, remember, everyone loved until they realized how quickly the good content ran out) and Warhammer Online (which was buggy and messy, but nothing close to how buggy and messy Alganon is at the moment). I skipped some of the comments. Honestly, I have no problem with copying everything from WoW but the end game paradigm. Having played WoW for getting close to 5 years, I would love something that is essentially WoW but more of a sandbox. Why try to fix something that isn't broken? It is sad that the game seems to be in such a sorry state because otherwise I'd be somewhat interested. Thanks for saving me some cash! Yes, I am sure the OP is aware that Rangers can be tanks and healers. Which makes them not Rangers but WoW Druids. Except they use bows to cast their magical healing powers. It's not unique, it's stupid. Rangers are not Druids except here, which means Wardens will probably be Hunters. Magus is are sort of like Death Knights that only cast spells instead of melee, but in the most retarded sense. Soldiers are an exact copy of Warrior, everything they do, Shield Slam, Heroic... I mean Focus Strike even Battle Shout. All the same skills, and Healers are just Priests. Congrats, their revolutionary and unique classes are just renamed knock offs. "People can pick apart every aspect of Alganon they wish. We're busy building a commercial-grade fun MMOG that we all want to play. The Alganon UI was built from scratch. In addition, we use our own custom-built LUA system for our interface, which will allow full 3rd party support. We know many people will develop different (possible better) interfaces upon release. We will endorse this. Sometimes there is just the "right way" to do things when it comes to the presentation of world interaction. If there's similarities to other games, it's because they've done it right as well." I don't mind if a game is very similar to WoW. I really liked WoW. I am just so burned out on WoW, that I would enjoy a game that plays similarly but has new world, lore, etc. My only real concern are the massive number of bugs in the game. If they could get those fixed, I might be interested in this game. We'll see. As the Algnaon Community Manager I wanted to thank you for taking the time and energy to put this preview together. AS we continue though beta we rely on players like yourself to help us find and fix as many bug and issues as we can before our December 1, 2009 launch. Our launch date was recently moved up. I would invite anyone who hasn't played Alganon or who may be in beta but hasn't tested the game for a while to give it a try. While I would have to agree with the fact that Alganon needs a lot of work yet, your "Review" of it certainly sounded biased. You almost sound like a Wow Fanboy. The game has potential. If you play past level 5, you may find that. Of course there are going to be things that are the same as WoW.. Just like WoW has things that are like EQ and DAoC. And Warhammer had things that were like all the other ones before it. Wow a lot of comments are missing the point. This is not copying WoW in the same way that Blizzard copied earlier games, or how DDO, WoW, WAR, LOTRO, EQ, all have similar interfaces. This is cut and paste! Even the icons are the same. They couldn't even be bothered to make new icons. It's like the difference between writing a book about a small group of adventurers the hero of which is a short guy who has to destroy a powerful magic item, and just photocopying Tolkien and publishing it as your own. "to my mind it is just unethical to be soliciting pre-orders whilst advertising these features in such a way as to make it seem that they are already implemented and will be in-game at launch time" - see Funcom, Age of Conan pre-launch hype circa 2008. Companies that do this go on my "do not buy from" list, its just plain stealing in my book. Seriously, how can anybody defend that blatant copy of the interface? 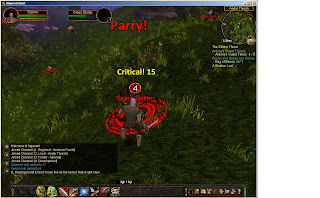 The game could have been a WoW-clone, and that would be "OK", but ffs, they didn't even spend 10 hours of work developing their own graphics for the UI. Even white windows with a black outline would have been better than using copyrighted art. Hell, couldn't they even find a more suitable MMO? They had to go for the most known. 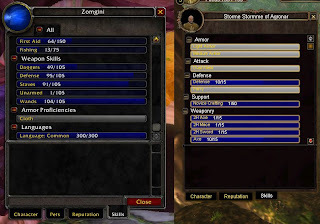 Can anybody tell me why WoW's interface is better than, let's say, LotR's when it comes to the appearance? Or AoC's? Or EQ2's? What they have done is, at least, illegal in most Western countries. I can't feel but pity for the CMs working for the game. It has to be quite embarrassing for them. Games got way too many problems, and they're talking about "releasing" it in a week. the forums already have a guy with issues trolling it sending threats via email. Pathetic. Damn shame too because IMO the games got some cool new ideas that could make it a big game. But they're going to screw it up and fail by rushing it out before it's ready. I never tried Alganon but this post makes me shake my head and laugh at the same time. It is not similarity, it is a shameless clone! Rofl. well i have just run a google search for Alganon review and found this.. I have been playing Alganon since launch but didnt play Beta, I also played WoW from start for a couple of years and everything from EQ to bang up to date stuff.I will be the first to admit the UI is very similar to WoW but like someone earlier said Blizard did make their UI very similar to various previous games like EQ etc.. I know you guys will probably flame me because that seems the mindset on this subject but i would like to make a few points. 1. I am VERY glad i bought and installed the game before reading this review as i like many people above would more than likely not and would of missed out on a lot of fun. 2. like i said i have played many games like this from the start (and joined them later in dev) but i have never seen a company respond so swiftly to reported bugs with patches/hotfixes as the guys at QoL they are literaly in game with us, if you have a problem they fix it! 3. The community reminds me of early Ultima Online or Everquest, there are no immature kids shouting in world chat and everyone is happy to help each other. maybe the beta was bad but try it now apart from a handful of broken quests ive not had any problems at all. 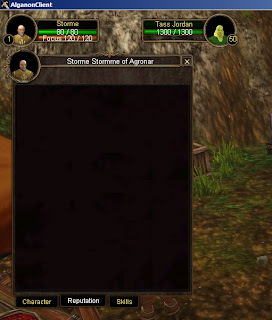 WoW's interface is better than LoTRO's because LoTRO's interface buttons are WAAAY too detailed which results in a button bar looking like mush on my screen with very little discerning art difference between each button. Thank you for this review BTW. I think i'll steer clear from this. Eh, this is always going to happen (not that I condone it) Even WoW is a hack from MUD days. Just check out something like the Iron Realms Text games, which have been around much longer then any graphical MMO and see all the similarities in game play.